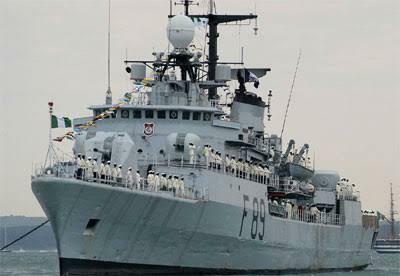 This is because the Nigerian Navy (NN) said it would cost a whopping $250million to refit the vessel, an amount that could buy many Offshore Patrol Vessels (OPVs) and boats to fight current security threats. The first of the MEKO 360 general purpose frigates built by German Blohm & Voss, Hamburg, NNS ARADU was one of three ships in the world with capabilities for simultaneous anti-air, anti-surface and anti-submarine warfare. The ship also had capability for electronic warfare and naval fire support. Speaking with reporters after the NN Ceremonial Sunset and dinner to mark its 61 anniversary, the Chief of the Naval Staff (CNS), Vice Admiral Ibok-Ette Ibas made it clear that refitting NNS ARADU was not an option for the now, because the Service’ budget was not enough to carry out its core responsibilities for six months. “The navy, just like any other service has never gotten what will enable it run for six months talk more of running through the year. But we all understand that the navy is an important service that protects where the resources come from and needs to be given special consideration. On how the NN has fared in its 61 years of existence, Ibas admitted there have been a lot of challenges, most of which the service surmounted. According to him, the nation has in the last few years, been faced with a lot of ups and downs following series of attacks on national security infrastructure. “The consequences of which saw to the drop in the nation’s revenue coming from oil but it was perfectly restored and we were able to contain the menace with the dedicated taskforce. To that extent, we have been able to provide the needed security at sea and in the past, we were able to contain the menace of militants and keep them away in addition to the dialogue initiated by the federal government. “You are also conversant with the issue of piracy, which the navy has been able to contain with our credible presence at sea. Ibas also condemned the fight between naval operatives and policemen in Cross River State, stating that a committee has been set up to probe the cause and ensure there was no repeat.